It has been said by many that teaching is one of life’s most noble professions. I wish that I could say that when I began my teaching career in 1973 it was because of a highly noble calling from somewhere above that led me to it. The truth of the matter was that I wanted to get off the road and needed to figure out a way to stay involved with jazz but still make money without traveling. Teaching seemed to be the only answer. When I was starting out back in the middle 50’s there were virtually no schools that offered instruction in jazz and even very little quality private teachers available. This being the situation I had to figure out a way to improve my playing on my own. (which was probably what everyone else in that era and before had done) The method that I came up with was a systematic plan involving the study of the works of the master players past and present that I admired. My routine was to transcribe a solo of a master player at the beginning of the week, memorize it while analyzing it’s contents, extract small phrases from it and play them in all 12 keys. The next week would bring in a new solo, usually with a different artist, and with me employing the same practice format.This went on for a very long period and it definitely changed my status as a jazz musician. By studying so many different great players I found that I was able to improvise fluently in the jazz language but with my own voice and personal concept. When I left the George Shearing Quintet in 1973 and began teaching this is the method that I used for all of my students and I must say that it worked great. I used to tease some of my great kids like Ted Nash and Andy Martin that if I had had me to study with I could have reached my goals a heck of a lot quicker because I was the one who had to go down into the mines and figure all of this out. Is this the only way to learn how to play jazz?? Definitely not but all I can say is that it worked for me and hundreds of my students over the years… and, it’s still working as 4 of my current students here on the California central coast were awarded the top prize as the best community college combo in America last year by Downbeat magazine. It’s not a quick fix and requires patience and stick-to-ittiveness but then everything worthwhile does. 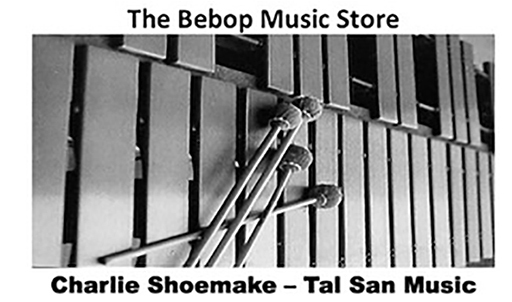 The people that I (and my students) learned from are the ones whose collections we offer on our Bebop Music Store site. Of course there are other great players that have come onto the jazz scene in recent years but I feel that the people that we offer on our site definitely form an extremely powerful body of important jazz information. 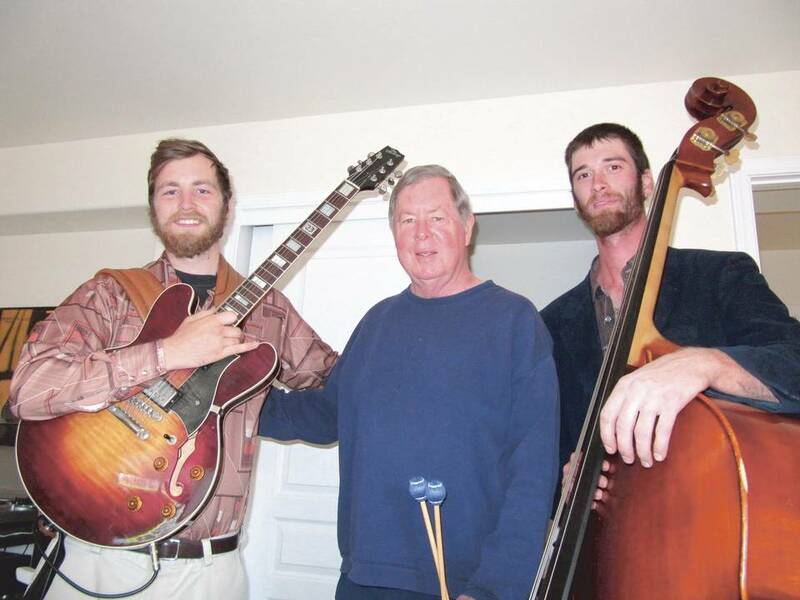 Guitarist Josh Collins, 20, and bassist Keegan Harshman, 23, joined Charlie Shoemake, center, and Sandi Shoemake at Painted Sky Studios in Harmony, Ca. Collins and Harshman are part of Sperdak, a Cuesta College jazz combo that won a national award for best community college jazz combo in the nation from none other than the legendary DownBeat magazine.